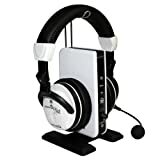 Ear Force X41 (XBOX LIVE Chat + Wireless Digital RF Game Audio with Dolby Headphone 7.1 Surround Sound) (UPC 731855021703) is sold at the following online stores. We've find the latest prices so you can compare prices and save money when making your purchases online. Please click on the links below to browse to each store's webpage.